October, 10th, 2014: Aalim Hakim, India’s iconic celebrity hairstylist, celebrated the opening of its newest outlet in Ahmedabad, Gujarat. With a soaring career graph which is a testament to his exceptional skills, Aalim gained recognition for his talent and his modernism. Standing tall at the peak of his career today, Aalim has salons across the globe, in Mumbai, Hyderabad, Bangalore, Dubai and now in Ahmedabad by the name of Hakim’s Aalim Hair & Spa Lounge. His salons are the most hip, swanky and artistic salons in the country with a live DJ spinning cool music all day to keep his guests entertained. He was the first to call a hair salon a lounge, the only one to hire a DJ in his lounge and one of the first to introduce body art with hair treatments. "I believe hair is the only part of the body which you can experiment with and keep on changing. People in Ahmedabad want to be fashionable, but don’t have options. 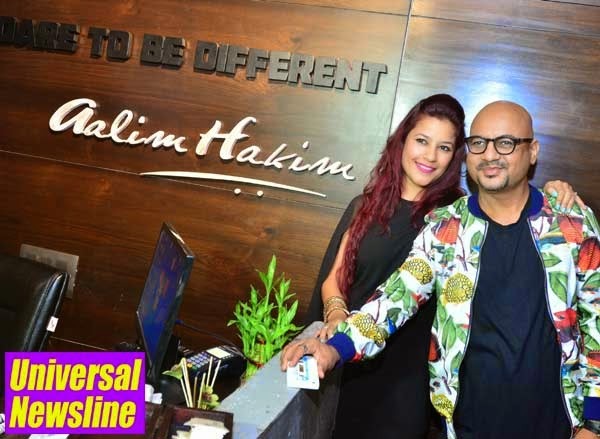 Hakim’s Aalim in Ahmedabad will offer all types of hair and beauty services," says Aalim. "My aim is not to work with just celebs. I want to educate everyone about their hair and how it should be treated." adds the stylist. By his creative cuts and impeccable styling, Aalim has managed to carve a strong niche for himself in the cine industry and is the first choice of celebs like Hrithik Roshan, Ranveer Singh, Salman Khan, Ranbir Kapoor, John Abraham, Sahid Kapoor, Katrina Kaif, Biapasha Basu and many other Bollywood celebrities. From the moment you walk into Hakim’s Aalim Hair Lounge you gets transported into a new world- a world of calm and serene. Located in a sprawling and soothing rustic space on SG Road in Ahmedabad, the lounge is spread across 4500 square feet and is the same building of the More Mischief clothing brand for men. The natural elements, wood, water and stone enshrine the entire Lounge transporting you immediately into a totally different reality. One can sit back relax and enjoy their hair cut, colour, relaxing, rebounding, perming, spa, manicure, pedicure or head massage while grooving to the beats of our very own in house DJ . Hakim’s Aalim Hair and Beauty Lounge in Ahmedabad is co-owned by Directors Mrs. Shimoli Amin & Mrs. Manini Amin , who decided to get the brand to Ahmedabad and to cater to the city's swish.The duo and their better halves Mr. Archit Amit & Mr. Suchit Amin have also launched the exclusive bespoke designer menswear brand; ‘ MORE MISCHIEF’ in Ahmedabad. Boasting of an exclusive clientele that includes the upper crust of the society – socialites, actors, politicians, builders, sportsmen and so on, More Mischief is recognized as a dependable brand that actually understands the fine art of tailoring.